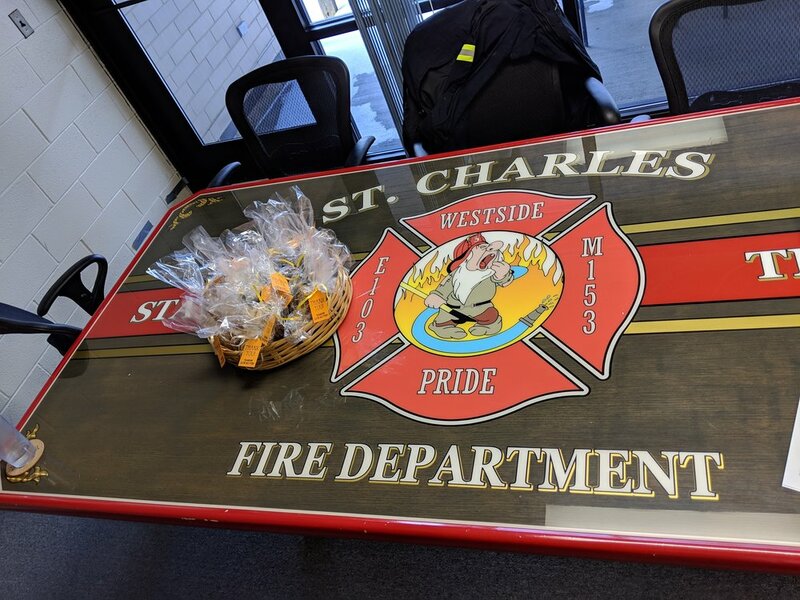 RAM will be coordinating an outreach effort to engage our St. Charles community in performing random acts of kindness during Random Acts of Kindness Week, February 11-17, 2019. This is what we’re doing to Paint the Town Orange with Random Acts Of Kindness! Click here to see the calendar of events for the week!! Join us or let us know what Acts you are doing to spread care and compassion during this very special week! Goal: To share care and compassion, throughout our community, through random acts of kindness. Who: Everyone is encouraged to participate. 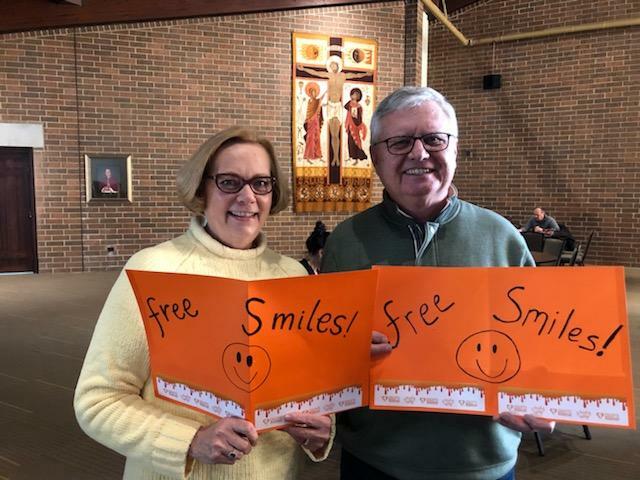 Individuals, students, businesses, coworkers, neighbors, church groups — we need everyone to help us cover St. Charles in kindness! Cheers to another fantastic Random Acts of Kindness Week. RAM leadership started the night by visiting different restaurants around town and buying a meal for a stranger! Jen and Jon even handed out gift cards at McDonalds drive up!! Thanks to our incredible neighbors who actively sought out opportunities for kindness all week long! We heard so many stories of folks giving and receiving Acts great and small! All the stories started with a smile!! 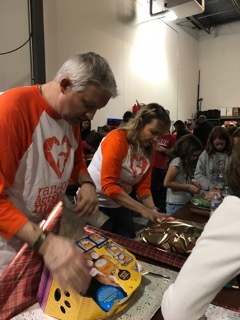 We would have been unable to Paint This Town Orange without an amazing group of RAM leaders who ran all over town doing everything from putting up yard signs, giving out paint cans, baking and delivering treats and even sharing kisses ( chocolate ones) and roses to brighten a strangers day! A very special "thank you" to our founder Jim who started it all just 2 years ago!! His vision of a community of kindness is happening as we speak!! Let's make every single day a Random Act of Kindness Day!! 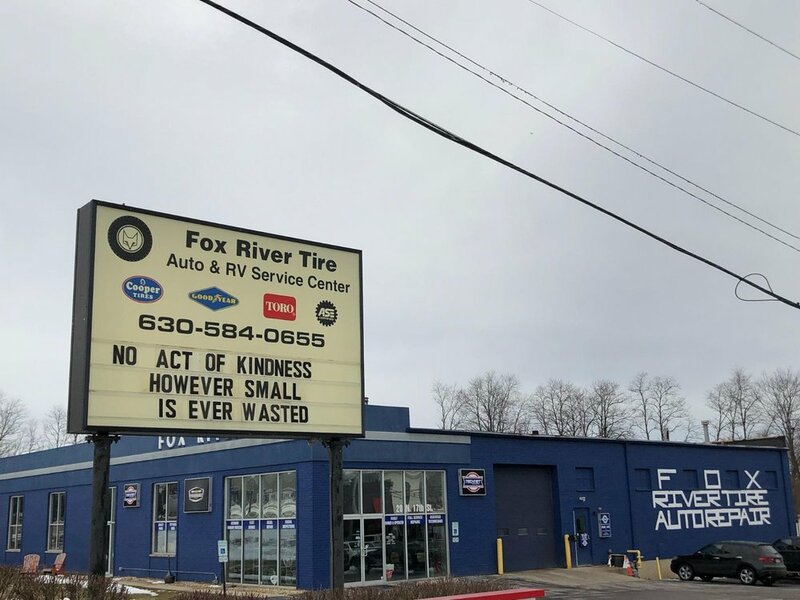 Just one example of the wonderful participation of our local businesses in Random Acts of Kindness Week 2019!! Thanks! Shawn and Bill delivered this Cake of Kindness to the folks working at Tri-Com 911 center! Saturday morning some of our terrific volunteers handed out "cuties" oranges to folks at Norris Center! We also shared "cuties" and water with people at XSport Fitness! Our volunteers made lots of people smile! Thanks! 3 of our founding RAM members shared orange roses Friday night with folks at Charlestowne Theatre. Spreading kindness and beauty! Great job ladies! Check out these adorable cookies for the Lazarus House staff!! It's been an incredible day of RAM sharing home baked goodies for "people who serve" our community! Thanks to all the RAMBakers!! At our studio with our Middle School Girls! 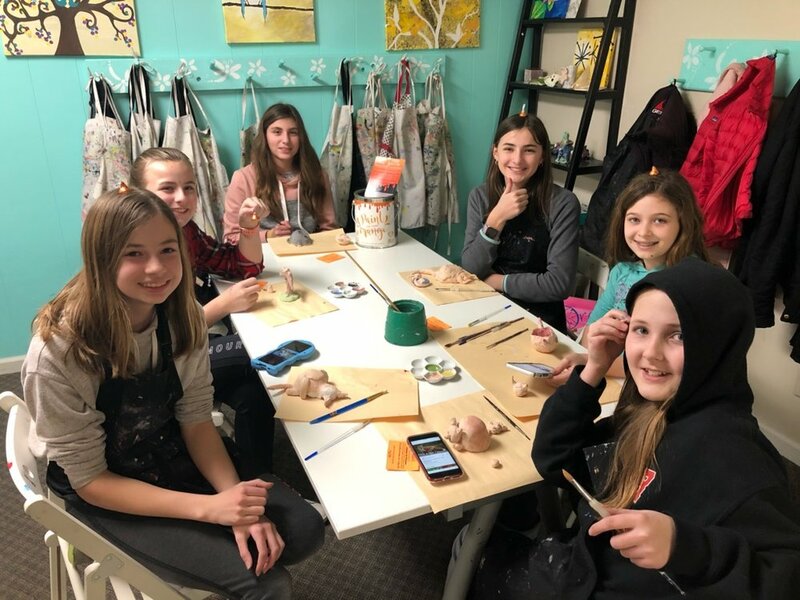 Continuing our week of Random Acts Matter with All Things Art Studio. 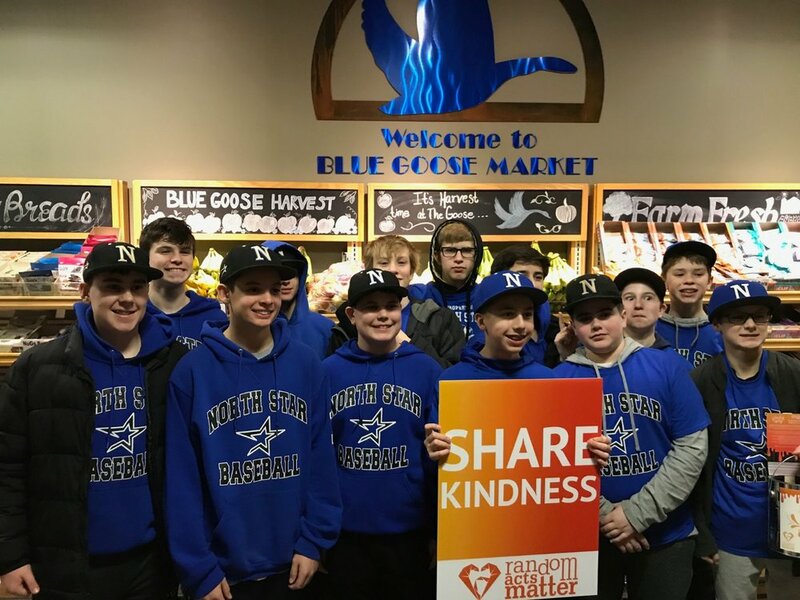 St. Charles North baseball players helped customers carry their groceries!! Great job guys!! 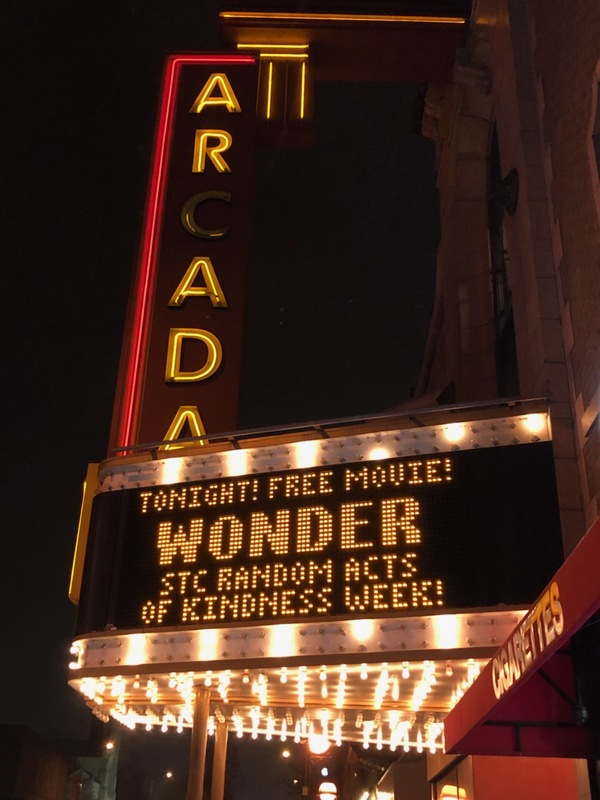 Thanks to everyone at the beautiful Arcada Theatre for sharing a random act of kindness with our community! And thanks to everyone who braved the weather to join us!! Thanks to Jon and Jordynn, 2 awesome D303 Transition OJT students working at The Daily Bean!! They are helping us kick off Random Acts of Kindness Week today! Stop by the STC Library some morning when school is open for a cup of coffee and great service by these terrific students! This neighborhood is starting Random Acts of Kindness Week with a little thank you to the garbage carriers!! ISN’T THIS AWESOME!!! GOSH, THIS SWEET SMILE SAYS IT ALL!! Here is another RANDOM ACT completed by TEAM 2: Thank you to Meagan Wizceb, Margie Wheeler, Kathy Krasnowski and Cheryl Cunningham for making this lovely woman’s day brighter. If you are downtown, check out the fantastic Municipal Building window!! Great creativity and hard work by Shannon Glab!! Our last awesome ACT for January was truly a labor of care and compassion!! This particular RANDOM ACT OF KINDNESS was for a woman and her husband who had come into some health issues and other challenges. The couple needed some interior walls painted which was a tall order but our TEAM graciously took on the challenge!! Two volunteers, Dan and Matt spackled and sanded Thursday evening then the 4 man team painted the living room and hallway the following Saturday. RAM volunteer Ryan Carney encouraging his coworkers!! Check out Team Mason, Faith, Brammeier and Hoscheit! Kindness to our community is nothing new to this group! Check out the mural in their office, there is a certain orange logo in the corner!! Our schools are turning orange! Thompson Middle School loves orange!! Way to go Anderson Elementary School!! 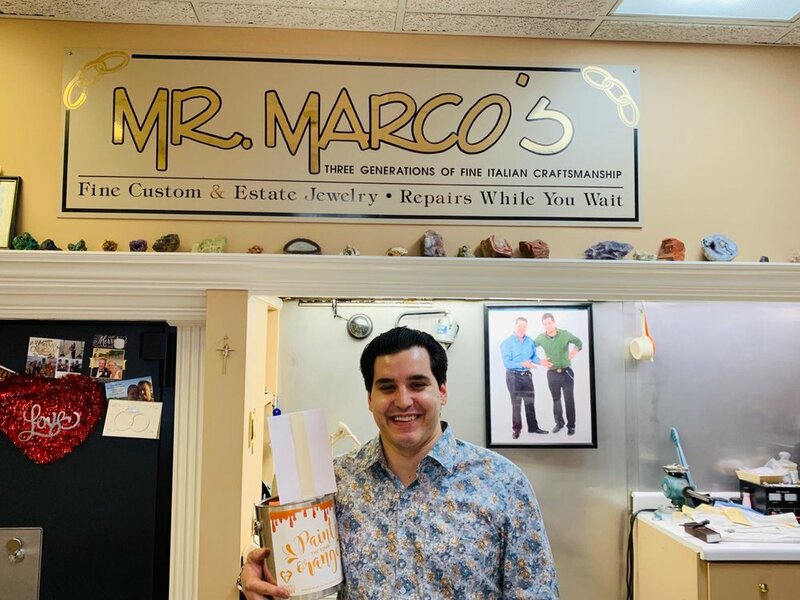 Stop in and visit Mr Marco’s jewelers and they will tell you about Random Acts of Kindness week! 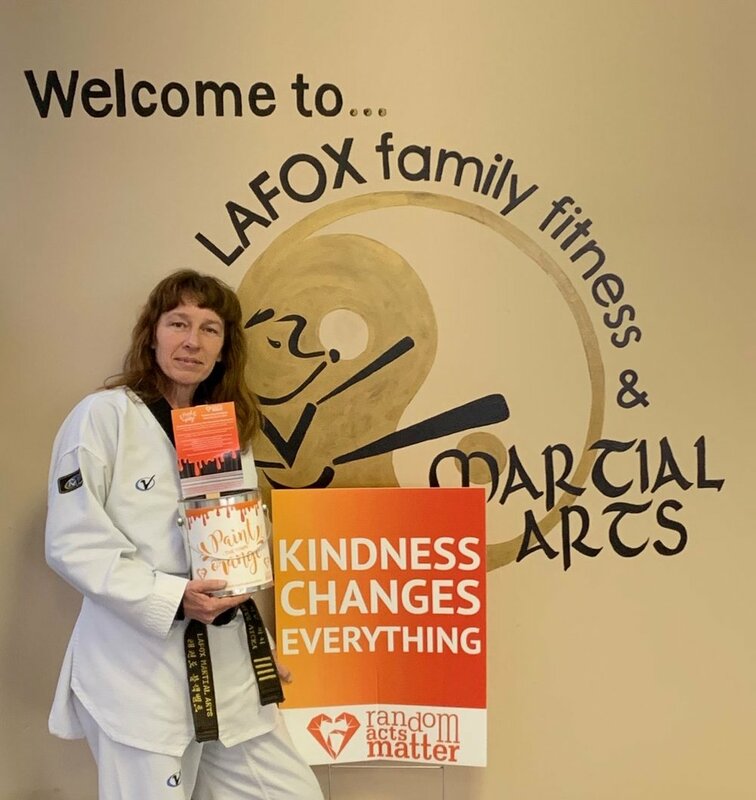 LaFox Family Fitness & Martial Art owner Vicky Vandiver will help RAM spread kindness! Her students will take RAMS to go and find other ways to be nice in our community. We want to thank LaFox BlackBelt team for always helping RAM with An Evening of Random Acts!! Say hi to Taylor at Main Street Pub. 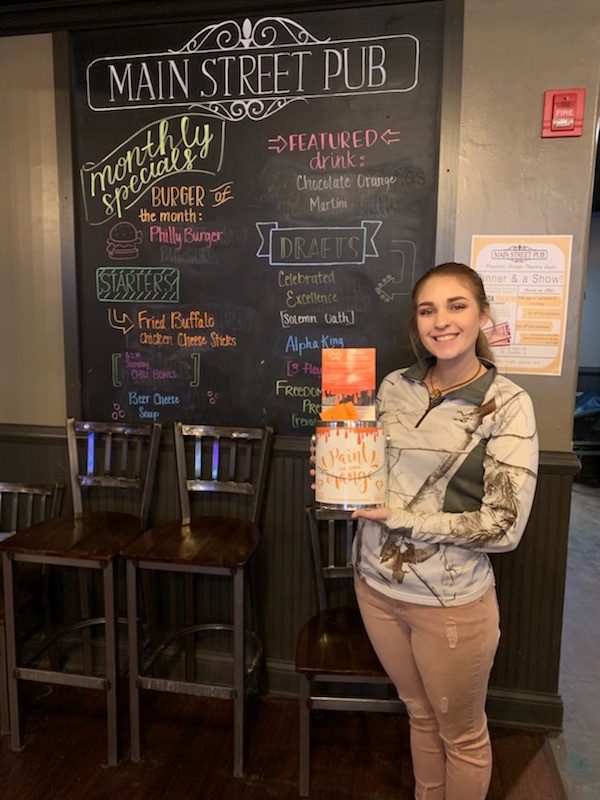 Main Street Pub will have our Paint the Town Orange can on the bar this week. 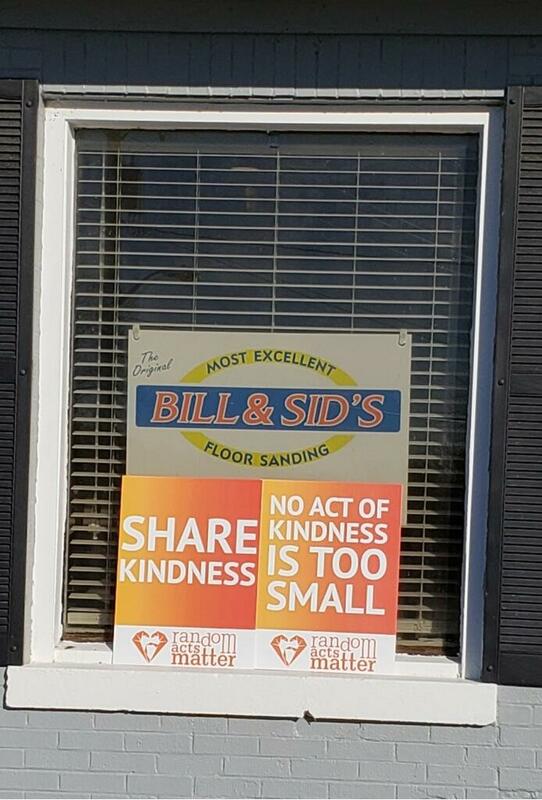 Stop in and choose a random act of kindness to share with St. Charles. Pomadora Mozzeralla is proud to display the Paint the Town Orange can!! Stop in and say hi and help RAM Thank Sherwin-Williams! Sherwin-William donated all the Paint the Town Orange Cans and paint sticks ! Thank you Sherwin-Williams! And, while you are there, take a RAM to go- Spread Kindness!! Smittys displaying the Paint the Town Orange can! 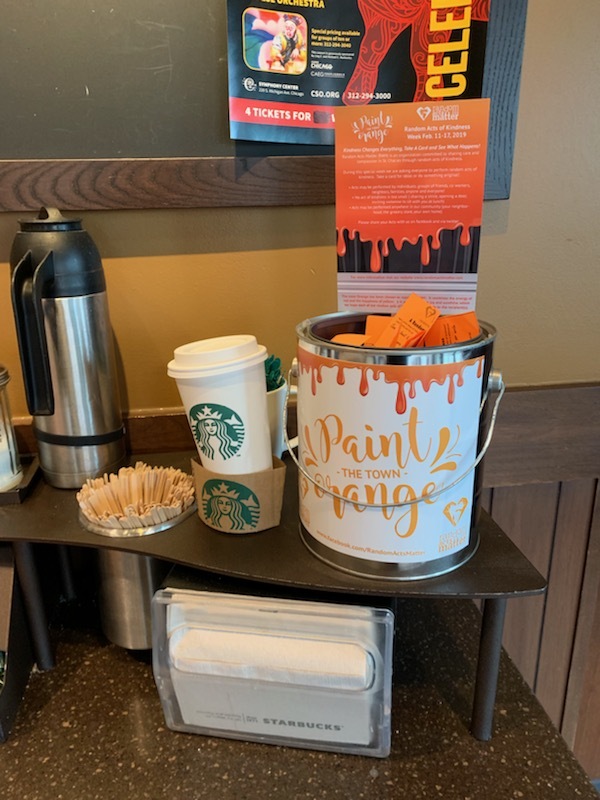 Starbucks on Route 64 near Randall road has Random Acts Matter Paint the Town Orange can right near the coffee cream....take a random act of kindness suggestion with you and spread kindness throughout St Charles! ttsg (Total Technology Solutions Group), Joe Kwitkowski ....Joe will be encouraging their team to do Random Acts of Kindness all week! Have a glass of wine and get inspired to spread kindness at Vintage 53! Jeans and A Cute Top Shop is helping share great ideas for random acts of kindness! See a movie at Charlestowne Theatre and look for signs of kindness!! 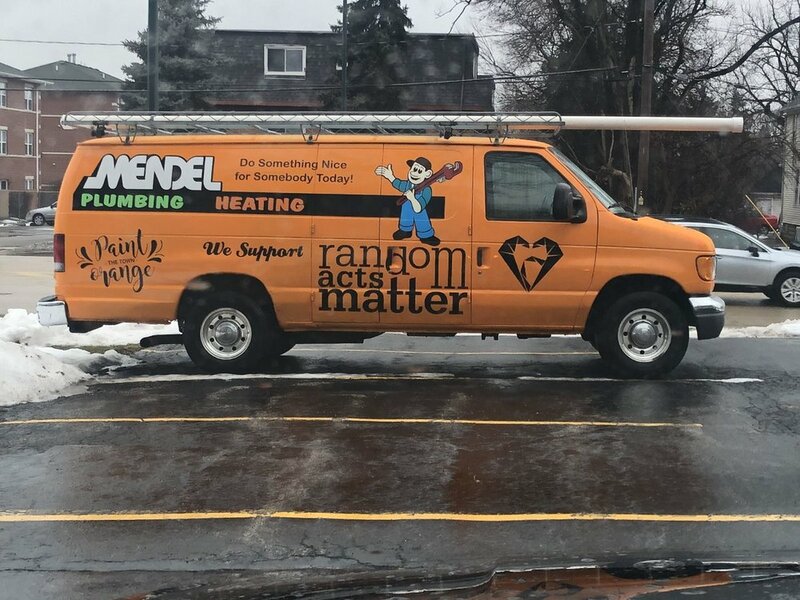 The Mendel Van is ready to drive around town and spread kindness! 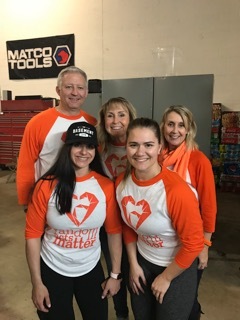 Thanks to the amazing Allison Rosati and Ron her terrific cameraman for doing a segment on Random Acts Matter and Paint The Town Orange Week! Watch NBC 5 on Wednesday night at 6!! Segment on Random Acts Matter and Paint The Town Orange Week! Watch NBC 5 on Wednesday, Feb 13th, at 6pm!! This valentine was written by a Bell Graham student, what a wonderful Act of Kindness!! RAM volunteer Shannon Glab leads an ASE class at Bell Graham School! Imagine a class dedicated to learning about kindness! Awesome job!! Honoring “people who serve” our community today with homemade treats. One team shared yummy morsels at all 3 firehouses, the police station, Pottawatomie including preschool and Senior Center staffs and Hickory Knolls staff!! Thanks to all the bakers who worked to add a little love and kindness with the sugar and flour!! A group of residents at The Bickford attend a presentation about Random Acts Matter by Pat Reding. Puebla Modern Mexican is helping to Paint the Town Orange by treating there guests to deep fried cheesecake with ice cream! 🧡. The first recipients were quite excited by Kim’s generousity and kindness! If you don’t have plans, you should check this out. The recipients took a random act from the Paint the Town Orange bucket and will be showing up somewhere in town. What: What can you do to share Kindness? Click on the link below for some great ideas!! Watch Allison Rosati talk about Random Acts Matter!! Other questions: Please contact our Paint the Town Orange chairperson, Michelle Buck, via email at dmbuck34@comcast.net or Jen Rothenberg, via email at jonjenrothenberg@gmail.com.